A few years ago, when I was the Assistant Producer for Spirit Sundae (SBAC1), we featured the wonderful work done by Habitat for Humanity. Founded in 1996, Habitat for Humanity South Africa is the national organisation of Habitat for Humanity International and part of Habitat’s Europe, Middle East and African region. Habitat South Africa is entirely self-funded and works in partnership with all stakeholders to serve the poor and marginalised in our country. Based on the firm belief that decent shelter provides the greatest opportunity for families to break the cycle of poverty, Habitat works with all people to give a hand up in building homes, communities and hope. 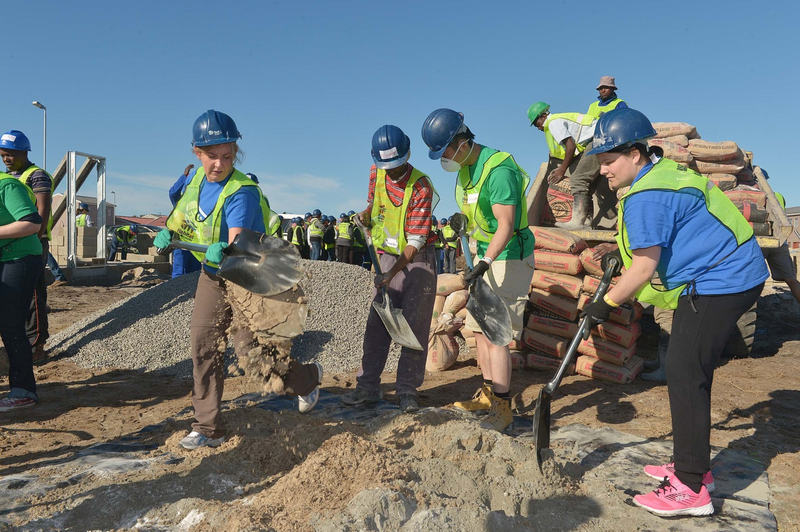 Now, in partnership with Power Construction, the City of Cape Town and the Western Cape Government, Habitat for Humanity is calling on all active citizens to come together and join them in their Desmond Tutu International Build Week in Pelican Park from 2 – 6 March 2015. Responding and putting into action the request in the words of their patron Archbishop Desmond Tutu “Do your little bit of good where you are – it’s those little bits of good put together that overwhelm the world’. Teams from as far afield as the USA and Ireland will be joining the build event together with 18 of Habitat’s International Board of Directors from across the 70 countries in which Habitat operates, as they have chosen Cape Town as their venue for their Board meeting this year. Funding provided by the event, helps provide valuable funding for Habitat’s Social Facilitation Programme as part of Habitat’s community development work in the Pelican Park project. Through their Social Facilitation Programme, in partnership with the communities and galvanising the support of active citizens and other stakeholder partners, communities are empowered to take ownership of their communities through leadership, skills development and self-belief to become the champions of their own developments and their communities. “Our five-year goal through our community development process is to meaningfully transform the lives of at least 100, 000 fellow South Africans living in communities across South Africa. Help us achieve this by joining our team build event, helping to build homes, communities and hope” said Adrienne Burke, Habitat’s Marketing Manager. If you or your company are interested in getting involved, then please contact Habitat’s Head Office on 021 657 5640. This entry was posted in Uncategorized and tagged Desmond Tutu, Desmond Tutu International Build Week, Habitat for Humanity. Bookmark the permalink.